The challenge of Big Data is more than a question of size; it’s about time to insight and action. With the exponential growth of unstructured data such as social media, video and the raw data generated by smartphones and other “intelligent” machines, businesses are buried under an avalanche of data that renders even best-effort analytics slow and sometimes unreliable. As many businesses are learning in this age of Big Data, it’s not just what you know, but when you know it and how much you trust it. 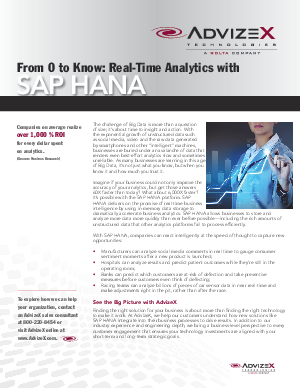 Download this white paper and learn that with SAP HANA, companies can react intelligently at the speed of thought to capture new opportunities.